View action from the day on Tennis Channel. Children in Harlem got a chance to play tennis and learn about the history of African Americans in the sport today, as USTA Eastern and the Harlem Junior Tennis and Education Program hosted a free 10 and Under Tennis Play Day at Howard Bennett Playground. The event, which was held as part of HARLEM WEEK, featured tennis clinics for kids using equipment tailored to their age and size, and a special mobile exhibit, "Breaking the Barriers: The ATA and Black Tennis Pioneers." 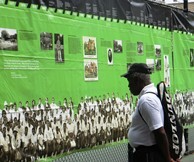 The exhibit, which was produced by the International Tennis Hall of Fame & Museum, describes the origins and history of the American Tennis Association (ATA), established in 1916 to promote tennis and help blacks gain access to tournament tennis. The event was held as part of HARLEM WEEK, which offers more than 100 events throughout the summer to celebrate the neighborhood’s assets and unique flavor and promote Harlem’s history and culture. "We are so proud to have been a part of HARLEM WEEK this year," said Michelle Blake Wilson, Managing Director of Marketing and Communications for USTA Eastern. "The event gave kids a chance to enjoy kid-friendly tennis and learn about the history of tennis in the African American community." "The 10 and Under Tennis Play Day was an outstanding addition to HARLEM WEEK," said Lloyd Williams, President & CEO of The Greater Harlem Chamber of Commerce. "It not only exposed kids to tennis, but also highlighted some of the great tennis programs in our community." 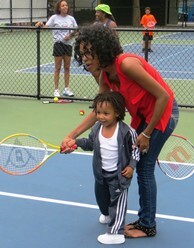 To learn more about 10 and Under Tennis or find programs in your area, visit 10andUnderTennis.com. To get the latest on upcoming Harlem Week events, check out harlemweek.com.